Scott SC bamboo rods seamlessly integrate the traditions of craftsmanship with the performance innovations of contemporary split cane technology to bring you fly rods that stand the test of time as works of art, and as serious fishing tools. 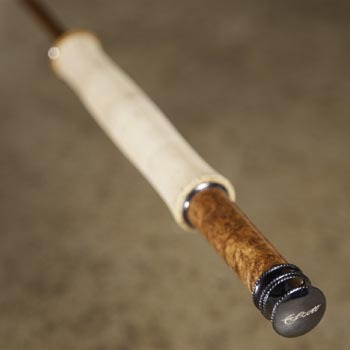 SC rods feature beautifully figured amboyna burl wood and blued nickel silver reel seats, Snakebrand guides and agate inserts, handmade ferrule plugs, and grips shaped from the finest cork. Each rod comes with a pair of matched tip sections. ~ Continuing our long tradition of partnering with the world’s top split cane rod makers, Scott is pleased to introduce the new three piece SC rods designed and built in collaboration with Naoki Hashimoto of Hokkaido, Japan. ~ Triple Heat Treated - SC bamboo is flamed before the culms are hand split, then heat treated after each strip is rough planed, and for a third time after the strips are hollowed and glued. This helps dramatically increase recovery speed. ~Hollow Construction - Keeps the rods very light and aids in increasing recovery speed by removing unwanted mass from each rod section. ~ Taper - Hand planed to exacting tolerances, SC rods feature unique taper designs optimized for three piece construction. A beautiful dry fly rod with tons of feel and exceptional loop control. 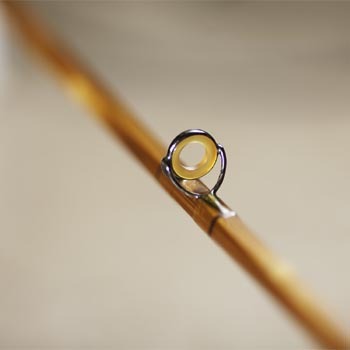 The littlest SC provides great tippet protection with surprising backbone to turn bigger fish and bring them in quickly. A perfect rod for mixed techniques on smaller waters, this SC is equally at home presenting small dries as it is hoppers or nymphs. With incredible balance and lightness, this rod is a pleasure to cast all day. Our all-around SC is at home on any size stream with dries, nymphs or small streamers. The perfect choice for a high performance versatile bamboo rod.